U.S. Senator Sheldon Whitehouse opened the Composites in Transportation Infrastructure Workshop, held July 21 at Roger Williams University. His remarks were the first of what turned into a valuable day where policymakers, technical experts and members of local industry explored how to apply Rhode Island’s composites expertise to the looming challenge of improving the nation’s infrastructure. There are 600,000 bridges in the United States. One in nine is rated as structurally deficient, and an estimated $20.5 billion is needed annually to repair those bridges. Rhode Island may be the state with the biggest need: 2014 Federal Highway Administration data ranks the state as last among all states due to its high percentage of structurally deficient bridges. Hosted by the Composites Alliance of Rhode Island and Polaris MEP, in partnership with Senator Whitehouse and the American Composites Manufacturers Association (ACMA), the workshop opened with a panel of remarks by Senator Whitehouse, Governor Gina Raimondo, US Congressman David Cicilline, RI Representative Ken Marshall, Anthony Rotondo of the U.S. Department of Transportation Federal Highway Administration, and Rhode Island Department of Transportation (RIDOT) Director Peter Alviti, Jr. Together, these individuals expressed their support for the state’s composites sector as a branch of advanced manufacturing with potential to grow and generate jobs. Both Rotondo and Alviti expressed their desire to explore new materials and how to integrate them into infrastructure projects. John Busel of the ACMA overviewed the use of composites in infrastructure projects, including this pedestrian bridge in Wales. In an overview on the use of composites in infrastructure, John Busel of the American Composites Manufacturers Association tabulated 262 bridge installations in the U.S. using composites, with the first built in 1991. 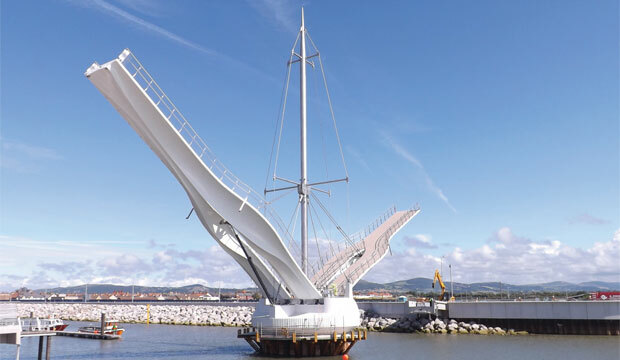 He detailed what composites have been used for—such as FRP (fiber reinforced polymer) rebar, cables, arches, footings, beams and girders —and also detailed several ground-breaking projects, such as the Pont Y Ddraig pedestrian bridge in Wales. Busel did a state-by-state comparison on composites’ use in infrastructure, and Maine topped the list with 43 projects followed by West Virginia and Ohio. According to Director Alviti, there are 14 projects currently using composites in the Ocean State. 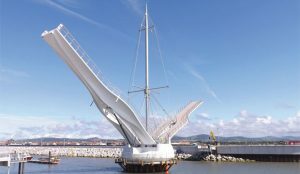 Compared to the vast numbers of bridges across the country, however, the number of structures incorporating composites is small. Despite the clear advantages of composites—with their light weight, high strength, corrosion resistance, accelerated construction time and durability—their utilization in infrastructure has much room to grow. Technical experts and innovators who have been working in this arena for years gave presentations on composites applications. Experts included: Dave White of the Sika Corporation, who also chairs the Transportation Structures Council at the ACMA; Dustin L. Troutman of Creative Pultrusions; John R. Hillman of HCB, Inc., creator of the Hillman Composite Beam; and Doug Gremel of Hughes Brothers. Click here for details on these experts and their presentations. In a two-hour afternoon session, Rich O’Meara of Core Composites, a member of the Composites Alliance of Rhode Island Steering Committee, detailed the capabilities resident in Rhode Island and Patty Steere of Steere Engineering, representing the Composites Alliance, facilitated a lively discussion amongst local industry members, DOT engineers, and experts about the practical steps that need to be taken to make composites a more prolific material and construction method in infrastructure projects. What surfaced quickly were the different approaches between composites entrepreneurs, who talked about innovating with composites to solve structural problems for clients, and those working on infrastructure projects that follow established guidelines to ensure public safety. The insights of the technical experts, who have worked with academia to develop their products and spent years laying the groundwork in standards development to bring this technology to the forefront, were particularly valuable. According to John Busel, the next step is to work with the DOT to implement the current technology that is the state of the composites practice. At the conclusion of the event, a new RI Composites Alliance Infrastructure Working Group was formed to move the process forward. RIDOT engineers and members of the R.I. composites industry and the Alliance will be a part of this new group. Their first meeting is slated for August. This workshop is part of a larger strategy of the RI Composites Alliance to grow the state’s composites industry by developing opportunities in three key sectors, including Infrastructure, Defense and Architecture.